Once there was a professor of a college. He was very student friendly and a humorous fellow yet had the brains of a genius. One day he decided to take a class on a very important topic. He went to a classroom and randomly placed some items on the table. The class began and without a word he picked up a large mayonnaise jar and then started to fill it in with rocks. He then asked the students if the jar was full. A bowl full of pebbles was thrown into the jar and they rolled and made their way into the large jar in the available nooks and crannies of the jar. Again the professor checked with the students if the jar is full. The students again gave a reply in affirmative. Now, the third and the final item that the professor added to the jar was a boxful of sand. The sand being fine and small in texture fit itself in a smooth flow in the nooks and crannies and the little places that were available in the jar. The professor asked the curious students “Now, is the jar full” The students gave a “YES”. Then the professor explained, your life is like the empty jar we began with. The rocks that you put in second in order were the most important things in your life your parents, your children, your family, your life partner, your health. The tiny little pebbles that we put in later were other things of the less importance you job, your house, your car. The sand is everything else, the nitty- gritty things of life. 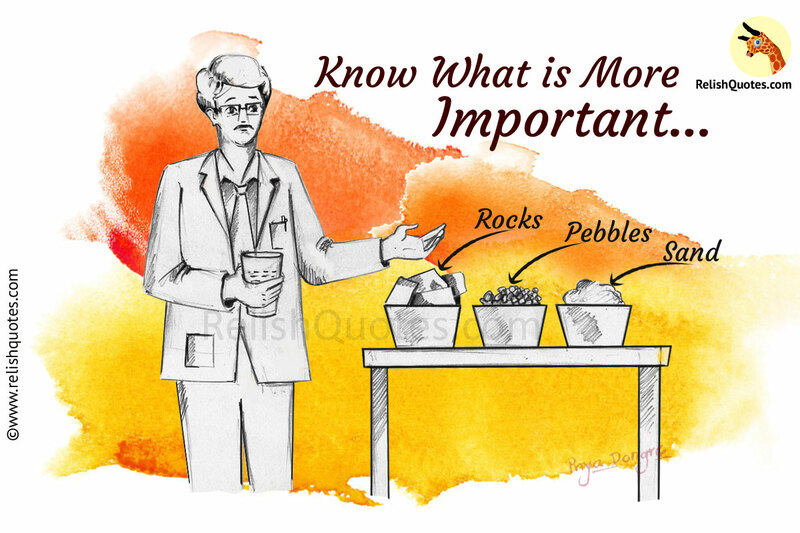 Take care of the rocks first……the quintessential things of life….the rest is just sand!